I go to the beach, I know when I have read 50 pages of my book, this is about enough sun for me, and truly rushing a tan does not work. I am on Sosua Beach in the Dominican Republic, one of the better tourist beaches. I do not carry water to the beach, I know when I am good and thirsty, it is also time to leave the beach. I take into consideration, and adjust for beach timing problems. 1. 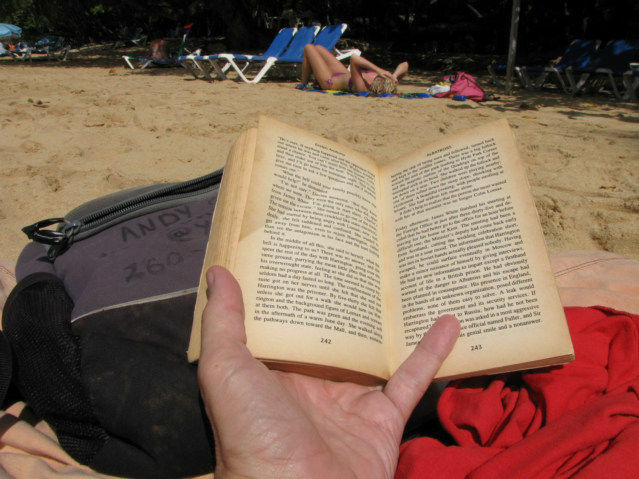 Too many bikinis and I do not read fast, not a problem on Sosua Beach. 2. Talking with friends, or when my strategic placement of beach blanket pays off. 3. The book is too good; I read and read, forgetting time. If you are wearing dark socks with dress shoes that goes along well with your business suit: please turn around and go back to the room. Alternatively, just go shop, and take a pass on the beach, you’re not in the game. I was hoping to find a higher cluster of Black Girls in small Bikinis here at Sosua Beach, this is not the best place, but there are few ringers. I need to return to Rio de Janeiro, Brazil for some serious beach work. I have all these little travel tips in my subconscious, have a few friends around make them surface for air.